Credit: NASA/CfA/J. Vrtilek et al. A new Chandra image shows remarkable detail and complexity in the central region of the compact galaxy group known as HCG 62. 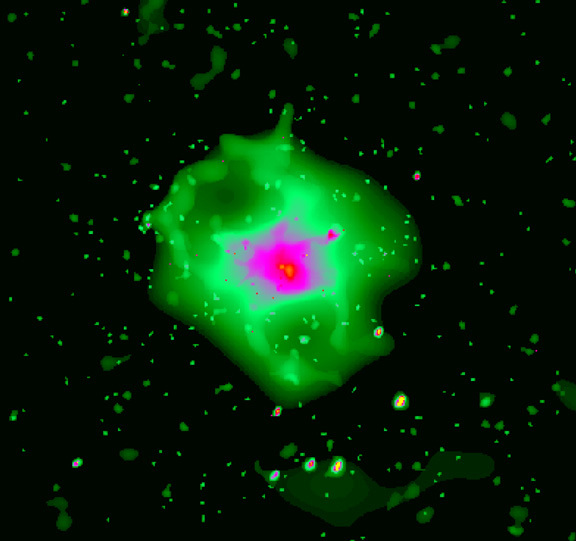 Such galaxy groups, which contain fewer galaxies than the better-known galaxy clusters, are an important class of objects because they may serve as cosmic building blocks in the large-scale structure of the universe. After galaxies themselves form in the early universe, such groups of galaxies may be the next systems to evolve. 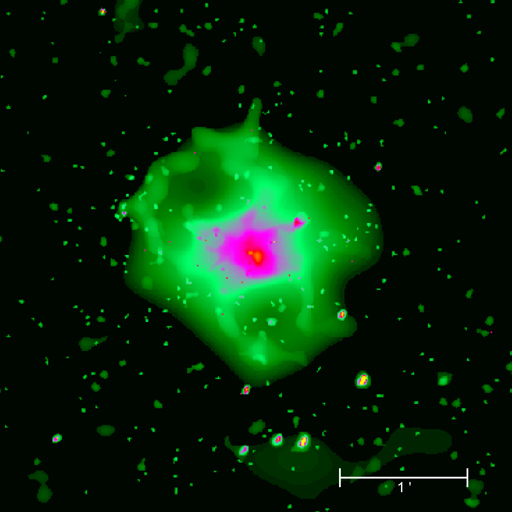 Later, it is believed, these groups of galaxies may combine with each other to form the bigger galaxy clusters. Most galaxies in the present-day universe are still in groups or poor clusters. Our own Milky Way Galaxy, along with about two dozen other galaxies, including the Andromeda Nebula (M31) and the Large and Small Magellanic Clouds, is part of a galaxy group known as the Local Group. A team of scientists, led by Jan Vrtilek (Harvard-Smithsonian Center for Astrophysics), observed HCG 62 with Chandra for about 50,000 seconds with the Advanced CCD Imaging Spectrometer. The range of X-ray surface brightness is represented in this image by various colors: green depicts the lower-brightness regions while purple and reddish indicate increasing X-ray intensity. The image is about four minutes of arc on a side, with north to the top and east to the left. Chandra is an excellent tool to study the intragroup gas (the material between the galaxies) since this medium is too hot (roughly ten million degrees Celsius) to emit any significant radiation at optical wavelengths, but instead radiates most strongly in X-rays. Chandra also offers by far the highest angular resolution of any X-ray telescope to date, which is essential for showing the detailed structure of a complex source such as HCG 62. Hence, this X-ray observation provides a unique window for determining the physical characteristics of the galaxy group. Perhaps the most striking features of this X-ray image of HCG 62 are the two cavities that appear nearly symmetrically opposite one another (upper left and lower right) in the hot, X-ray emitting gas. These cavities might be explained by the presence of X-ray absorbing material, but are more likely due to jets of particles recently emitted from the core of NGC 4761, the central elliptical galaxy of HCG 62, although no such jets are visible today. Credit NASA/CfA/J. Vrtilek et al. Coordinates (J2000) RA 12h 53m 08.10s | Dec -09° 13´ 27.00"